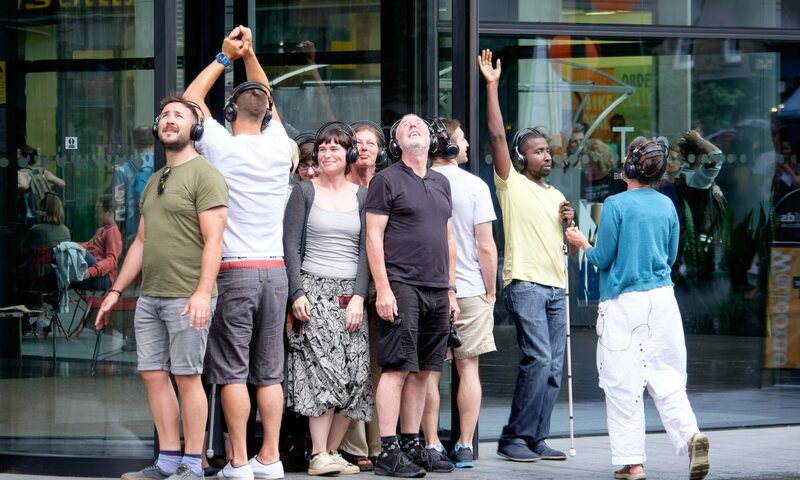 White Cane 2016 and 2017 and 2018 (ST) UK National Tour of international festivals, site specific locations: City Street, A City Garden, a Railway Station, a Local Park, various Corridors and access routes. Isabel Jones and Duncan Chapman received the prestigious Sound and Music composer / curator award to set up a national tour of White Cane with Viola Player Takashi Kikuchi, and performer Mickel Smithen. The work was also supported by Arts Council England and toured to Spitalfields Contemporary Music Festival 2016 and 2017, Huddersfield Contemporary Music Festival Spring and Autumn 2016 and Colchester First Sight Gallery Spring and Autumn 2016. The Curve Leicester with People Dancing Winter 2017. DMU Interfaces International New Music Conference September 2018. And a whisper that we’ll be taking it to Japan. Made In Corby Touchstone Corby Cube March 2014 (ST) Site Specific Performance at Corby Cube. On the slope going through the library. Commissioned by Made In Corby with Fermynwoods Contemporary Art. Isabel Jones Director/ Choreographer/ Audio Describer. Music co-composed by: Isabel Jones, & Duncan Chapman. Performers: Isabel Jones, Duncan Chapman and Mickel Smithen. Open Doors March /June 2014 (VIVA) Commissioned by VIVA Orchestra. 3 new music Orchestral Concerts and installation with VIVA Orchestra at Ashmount Special School Loughborough and De’Montfort Hall, Leicester co–directed/composed by Duncan Chapman and Isabel Jones. With 16 learning disabled children and their teachers alongside 8 Orchestral players. Gesture Corby Cube March – March 2013 (ST) Site Specific Residency at Corby Cube. Commissioned by Fermynwoods Contemporary Art awarded to Isabel Jones Director/ Choreographer/composer to develop Sung Audio Description as a choreographic art from. Dancers: Indra Slavena and Mickel Smithen. FRAGILE? Estonia October 2011 – April 2013 (ST) Commissioned by Baerum Kultuhus Norway with EU funding. Isabel Jones was the UK director/ choreographer and Curator of Fragile? working to develop links to 18 European countries. The project explores new performance work led by the aesthetic and creativity of visually impaired artists. Gesture Corby Cube March – July 2013 (ST) Site Specific Residency at Corby Cube. Commissioned by Fermynwoods Contemporary Art awarded to Isabel Jones Director/ Choreographer/composer to develop Sung Audio Description as a choreographic art from. Dancers: Indra Slavena and Mickel Smithen. Can’t Stop Me Shining 2012 Project 20 (ST) Sound Art Film on Exhibition for Embrace Arts Leicester. Words Nathan Campbell Music: Isabel Jones, Film Kevin Hodgetts. Impossible Birds July and September 2010 Project 20 (ST and Work+Play) Impossible Birds Exhibition was the culmination of a 3 year project with 45 learning disabled people where Isabel Jones / Salamanda Tandem trained a local team and supported the development of 28 LD artists and founded Arty Party with Kevin Hodgetts, Disability Development officer. Telford and Wrekin District Council. Red Start Concert Blaison Goyer France May 2007 (ST and the Jazz Trio Three) A music quartet and site specific performance for a house in France directed by Isabel Jones and Tony Baker with co-creators/musicians: Denni, Eric, Tony and Isabel. Site Dance Site Music July 2007 – June 2008 (ST) Commissioned by Impact Arts. 6 month Residency, 6 month evaluation project, Installation, and series of performances, for a new multi million pound PFI government flagship learning community in Telford. Hadley Learning Community. Directed by Isabel Jones with designer Richard Hughes and co-composers Isabel Jones and Duncan Chapman, photographer Geoffrey Fielding, Co-choreographer Julie Hood, producer Lisa Craddock, a company of disabled dancers and 2000 people engaged in the creative process. Via Crucis 2003 Eye Contact Dance Company (ST) Commissioned by The Sinfonia Chorale. Directed /choreographed by Isabel Jones, Co-choreographer Keith Barlow, Choir master Sinfonia Chorale Richard Roddis A site specific dance, choral work piece set in Southwell Minster – For full choir and 16 dancers with and without sight: Lewis Jones, Gwilym Jones, Rachel Jones, Lisa Craddock, Stuart Jones, Isabel Jones, James Hutchinson, Keith Barlow, Suzanne Barlow, Elaine Newton Fox, Leela Newton Fox, Eva Maria Mukta, Emma Johnson, Amy Lawrence, Jo Rowland, Ruth Marchewicz. Via Crucis Music – Franz Liszt. Le Festin 2003 (ST) New work Commissioned by Lakeside and Dance 4 – A film and dance made for the Gala opening of Nottingham’s new Lakeside Arts Centre. Directed by Isabel Jones with French Sculptor Gerard Renvez, Dancers: Julie Hood, Isabel Jones, Karen Mok, Martha Wildman. Light House 1996 (ST) Commissioned by Now Festival for Wollaton Hall, Museum Nottinghams. The 2nd in a series of 3 dance / light / voice / sculpture works which toured nationally to historic landmarks with Japanese Butoh dancers and medieval singers. Directed / Choregraphed by Isabel Jones, Co-composers Vivien Ellis and Isabel Jones. Sculptor Jo Fairfax. Co-choreographer: Naomi Mutoh. Dancers: Naomi Mutoh and Tamami Yamada, Singer Sian Cruz. House is My Reflection 1994 (ST) Commissioned by Nott Dance for Bonnington Art Gallery. Toured to Purcell Rooms, South Bank Centre, Tamworth media Centre, and to National Landmark Buildings including The Athenaeum, Burry St Edmunds in Suffolk. Directed and Choreographed by Isabel Jones. Sculptor Jo Fairfax. Co-composers / performers Vivien Ellis and Isabel Jones, Japanese Butoh dancer Naomi Mutoh.